ESCAPE THE FATE has been on the road with headlining tours, keeping busy since the successful release of their fifth studio album, Hate Me, on October 30th, 2015. The band have released the third music video from the current album, for the melodically-charged track “Remember Every Scar”, and you can watch it now on KNAC.COM right HERE. New live dates have also been confirmed and the current live itinerary is below. Following the trend of their desolate, fighter mentality found in their videos for “Just A Memory” and “Alive”, this new video does a great job at capturing the band’s seemingly endless, unyielding energy. 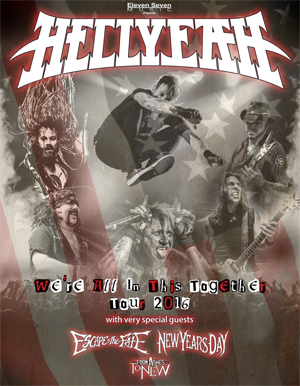 ESCAPE THE FATE will be special guests of HELLYEAH on the We're All In This Together Tour 2016, also featuring special guests NEW YEARS DAY and FROM ASHES TO NEW. The 18-date tour across the US will kick off on May 2nd in Baltimore, MD and ends June 5th in Las Vegas, NV. 5.25 - Arlington Heights, IL - H.O.M.E.